Food Writer’s Diary: What will Seamus Mullen do next? What will Seamus Mullen do next? 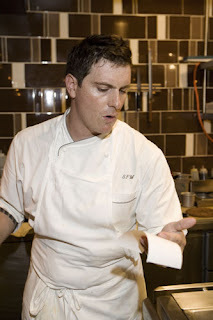 People who follow the New York restaurant scene closely were likely surprised and possibly saddened when it was announced several weeks ago that Seamus Mullen had left his job as executive chef and owner of Boqueria. Naturally, I asked Seamus what he was up to next, and he didn’t respond. That’s fair. It’s my job as a journalist to ask, it’s not his job to answer if he doesn’t feel like it. So he was either in Cuba or engaging in a complicated plot of subterfuge, and I don't think he takes me seriously enough to bother with subterfuge. But it means we get to speculate, and that’s always fun. What do you think Seamus Mullen will do next? Is he in Cuba doing research for some Latin-American-themed place, or is he just on vacation? Will he open a new restaurant in New York, or will he try his hand in a new market, like former Buddakan chef Lon Symensma recently said he’d be doing? Or has he had enough of the day-to-day restaurant rat race and possibly heading to lower-stress and probably higher paying jobs, like former Daniel executive chef Alex Lee, who's currently in charge of the food at Glen Oaks Country Club in Old Westbury New York (NRN’s classified ads saleswoman Leslie Wolowitz says the food is phenomenal), or like former Oceana executive chef Cornelius Gallagher, who's currently corporate chef for the Long Island-based Bohlsen Restaurant Group (and, I hear, considering joining the growing number of restaurateurs who are serving wine out of kegs)? I’ll leave the speculation up to you with the poll on the right. If you have different guesses about what he’s doing, please write a comment below. And Seamus, if you’re out there, obviously we’d love to hear from you. Just say “hi” if you like. How much are local ingredients worth to you?